India is doing reasonably well and with the formation of Narendra Modi govt, we should see growth rate being accelerated. A word about GDP as per Wikipedia states that GDP is the market value of all officially recognised final goods and services produced within a country in a year, or other given period of time. GDP per capita is often considered an indicator of a country's standard of living. 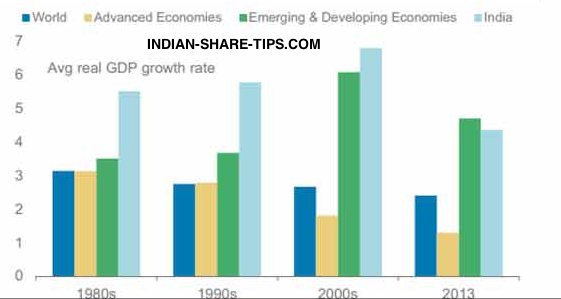 Have a look at below chart showing Gross domestic product (GDP) rate of India vs world for comparative analysis. You can also see year vise Indian GDP in past decade here. Bookmark us for world market news and get free email updates by subscribing for free updates in your inbox below.